Well where do we begin? 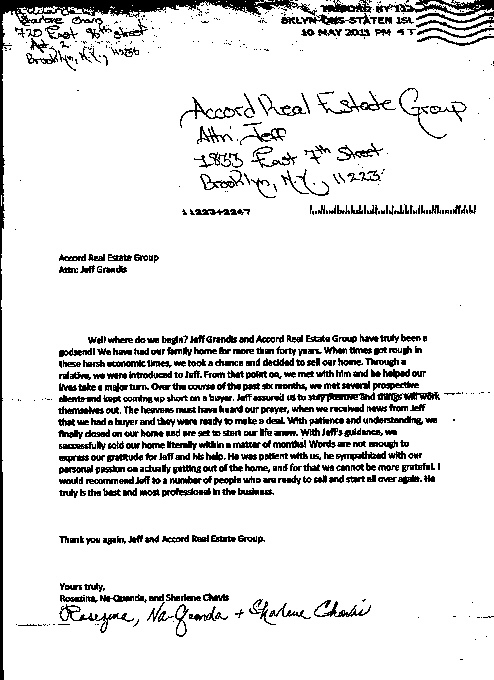 Jeff Grandis and Accord Real Estate Group have truly been a godsend! We have had our family home for more than 40 years. When times got rough in these harsh economic times, we took a chance and decided to sell our home. Through a relative, we were introduced to Jeff. From that point on, we met with him and he helped our lives take a major turn. Over the course of the past six months, we met several prospective clients and kept coming up short on a buyer. Jeff assured us to stay positive and things will work themselves out. The heavens must have heard our prayer, when we received news from Jeff that we had a buyer and they were ready to make a deal. With patience and understanding, we finally closed on our home and are set to start our life anew. With Jeff's guidance, we successfully sold our home literally within a matter of months! Words are not enough to express our gratitude for Jeff and his help. He was patient with us, he sympathized with our personal passion on actually getting out of the home, and for that we cannot be more grateful. I would recommend Jeff to a number of people who are ready to sell and start all over again. He truly is the best and most professional in the business. Thank you again Jeff and Accord Real Estate Group.